Representative Honours: Northern Ireland: 15 Full Caps / 7 Goals (1954-1962). Club Honours: (with Distillery) Co. Antrim Shield Runner-Up 1952/53; (with Brentford) Football League Division Four Champions 1962/63; (with Barrow) Football League Division Four Third (promoted) 1966/67. "Thrustful, courageous player with a fine burst of speed." Billy McAdams first took to goalscoring as a schoolboy at Grosvenor Secondary School. On leaving school at 15 he undertook an apprenticeship as a heating engineer and continued his footballing education as an amateur on the books at Banbridge Town and Glenavon. AT 17 he spent three months on trial at Burnley but his father rejected the terms offered and he returned to Belfast to join Distillery. His father was Sam 'Bull' McAdam, Distillery's all-time topscorer and young Billy inherited his father's knack of finding the net. McAdams made his debut in senior football for Distillery on Boxing Day, 1952. In a first season. interupted by a suspension for fighting with Fay Coyle, he scored 5 times. The pick of those was perhaps a brilliant 20 yard goal in the second Co. Antrim Shield Final replay against Linfield, a match sadly lost 2-1. He continued his good form into the following campaign, bagging four goals against Bangor on 21 September 1953 as well as another three hattricks against Ards, Glenavon and Bangor (again!). In December of that year he finally made it across the Irish Sea, Manchester City pipping a hesitant Oldham Athletic at the post for his signature. Just 19 when he joined City, McAdams hit the ground running with a debut goal against Sunderland on New Years Day, 1954. By the end of the 1953/54 season he had hit eleven League and Cup goals and also appearing in his first international, a 2-1 win over Wales in Wrexham. That match was regarded as a watershed for the Irish national team as Harry Gregg, Jackie Blanchflower and Peter McParland, who scored both the goals, made their debuts and the basis of Peter Doherty's great side had been founded. Sadly McAdams' role in the great successes of the 1950s was to be limited. In 1955 McAdams suffered a slipped disc during a friendly game against Millwall which threatened his career. He did not kick a ball for two seasons and missed Manchester City's appearances in the 1955 and 1956 FA Cup Finals. Although undoubtedly skilful, McAdams' greatest asset was his bustling style and willingness to get "stuck-in" though this made knocks inevitable. Further, he was plagued by continuing back problems throughout his career. 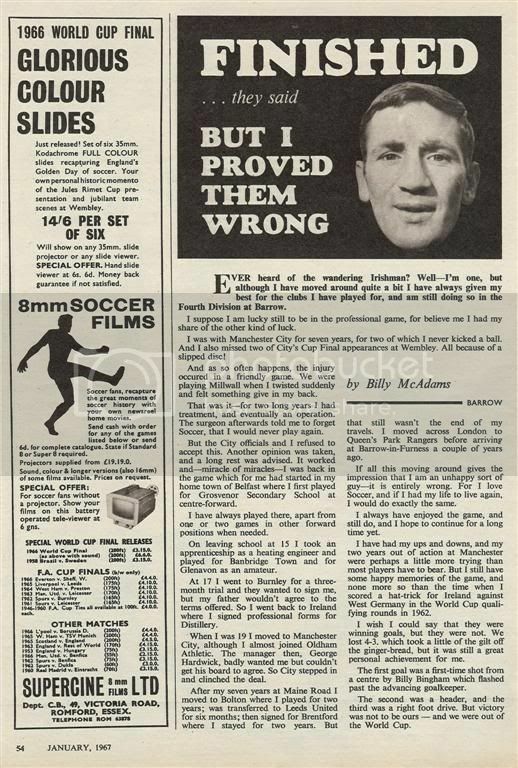 When fit, as he was for only 28 games of the 1957/58 season during which he scored 19 times, McAdams was among the most feared strikers in the English game. In that campaign he scored 10 goals in 10 consecutive First Division matches, a record matched only once and never bettered in any division of the Football League. Sadly, illness, injury and club commitments meant he was not a part of the Northern Ireland side that qualified for and excelled at the 1958 World Cup. The only match in which he played was the "down-graded" match against Italy, the infamous "Battle of Belfast". "The first goal was a first-time shot from a centre by Billy Bingham which flashed past the advancing goalkeeper. The second was a header, and the third was a right-foot drive. But victory was not to be ours [...] We lost 4-3, which took a little of the gilt off the gingerbread [!? ], but it was still a great personal achievement for me." McAdams' second campaign with Bolton was again ravaged by injury and he managed just eight goals. When his former Manchester City colleague Don Revie stepped in with a £12,000 bid to take him to Leeds United to spearhead their promotion bid, Bolton accepted with glee. The move never really worked out for either party as the same old problems emerged. During his time at Elland Road, McAdams did claim his final cap in a 4-0 defeat in Holland. He had managed a respectable seven goals in fifteen international appearances. After just seven month with Leeds, McAdams was on the move again, transferring to Fourth Division Brentford. He refound his old touch with the London-club, his 22 goals firing them to the 1962/63 title and promotion to the Third Division. After two seasons at Griffin Park McAdams moved across London to sign for QPR where he spent two more injury-interupted seasons. It was a move to Barrow in 1966 that perhaps proved McAdams happiest move, as it was in Barrow-in-Furness that he settled when his career was over. He made his Bluebirds debut in a 1-1 draw with Stockport on 20 August 1966 and scored his first goal for the club the following Saturday in a 3-1 win over Rochdale. In all he scored nine League goals as the club claimed promotion to Division Three. Perhaps his greatest goal in Barrow-colours was reserved for the visit of Southampton in the FA Cup third round, a screamer in a 2-2 draw infront of a 15,000 crowd. McAdams retired from the professional game in 1968 as one of Northern Ireland's most prolific goalscorers in the Football League. He later briefly managed the by then non-league Barrow in the late-1970s. Outside of football McAdams was a keen golfer and also accomplished on the bowling green. He remained a frequent visitor to Belfast even after he was struck-down by ME in the 1990s. He was afforded a benefit match between Barrow and a Manchester City XI as well as help from the PFA to supplement his invalidity benefit. Billy McAdams died in 2002 following a short battle with cancer. Summary: 15/7. Won 2, Drew 5, Lost 8. Are you Billy Juniors son? If so, say 'hi' to your dad. I'm Tony, from the Middleton side of the family. Interested to understand how your grandfather didn't play a more prominent role in Northern Ireland's qualifying campaign and participation for the 1958 WC in Sweden. Can you shed any light, that you may have heard straight from the horse's mouth so to speak? I know injuries played a significant part in Billy McAdams' career, however I read that club commitments were also a factor. Now I know clubs back in those days were not obligated to release players as they are now, but it seems hard to believe that club commitments would rob a player if the opportunity to play World Cup football. Can you enlighten please. NI took only 17 players when permitted 22. Even a half-fit Billy McAdams may have helped.